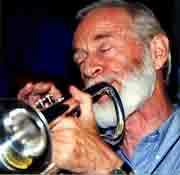 CORNET: Mike Slack from the UK, led the great Bourbon St Six in NY before coming to the Bay Area. His hot horn style is influenced by King Oliver, George Mitchel and Bubber Miley. TROMBONE: Jim Klippert, One of the great Bay Area tromonists, has appeared with Cafe Barrone All Stars, Magnolia Jazz Band, Zenith JB, the Albion Jazz Band and many more. CLARINET: Pete Main or Bob Embry -- two of the most talented local reed players fill the reed chair, seamlessly rotating in and out as their schedules permit . STRING BASS: Tom Clark , a Bay Area fixture, who played with the Jubilee Jazz band and the New Revival Jazzmen . DRUMS: Hugh O'Donnell's tasty drumming is the perfect compliment to the soloists. He's a veteran of the San Francisco Sartlight Orchestra. PIANO: Bill Gould is a New York native renowned for his Jelly Roll Morton like style and his interpretation of Ragtime. Appeared at the Blarney Castle in the 60's with the Jelly Roll jazz band. GUITAR Bill DeKuiper is much in demand for his stylish steady rhythm guitar. He is also the founder and leader of the Hot House Swing Band.